Sakura pays a visit to Yukito’s house in order to consult with Yue. Yukito transforms to Yue, where Sakura reveals her cards are now transparent. Further, the cards have no magic. However, Sakura’s magic still exists as she’s able to convert her key into her magic staff. Sakura then tells Yue about the figure she met in her dream. Since Sakura can’t provide more info, Kero-chan states that he’ll stay with Sakura for now. Yue requests Sakura talk with Yukito about this issue. She promises to do so. She cites that she can also speak with Syaoran as well. Sakura briefs Tomoyo and Syaoran about the situation with her cards and her dream. Syaoran worries about this, stating his belief that the person in Sakura’s dream is connected to the issue. 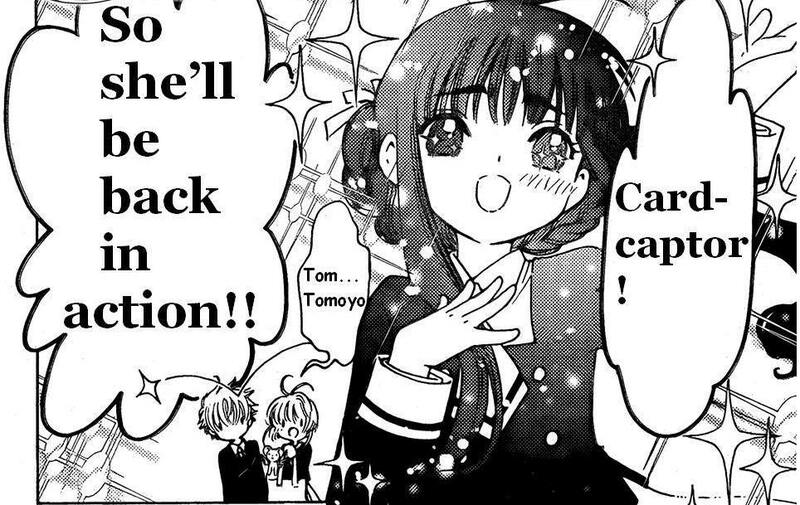 The prospect of Sakura performing as a Cardcaptor excites Tomoyo, who has costumes already at the ready. She also has them ready for Kero-chan. After Sakura leaves, Syaoran makes a remark to Tomoyo about how she distracted Sakura with her costume remark. She responds that she believes that everyone will help Sakura. With that, she joins Sakura, leaving a worried Syaoran behind. 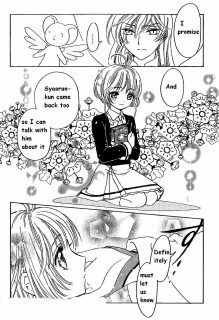 At school, Chiharu worries about Syaoran being in the same class as Yamazaki since her boyfriend has a reputation for falsehoods. Sure enough, Yamazaki spins a tale for Syaoran, backed up by Naoko. That evening, Sakura waits for a response to her text from Eriol. Kero-chan gives her some reassurance regarding his lack of response. That night, Sakura falls asleep where she sees the same figure in her dream. The figure doesn’t respond to Sakura’s inquiry. However, the figure produces a new key for Sakura. When Sakura wakes up, she discovers the key in her hand. Sakura hears noise from outside, so she opens her curtains. As she does, there is a wind apparently blowing out. In the sky, swirling around is what appears to be a massive snake body. Welp, time for a new chapter with more Cardcaptor Sakura goodness. As expected, the Sakura Cards are now transparent and non-magical. So I guess it isn’t much of a stretch to guess Sakura has to restore her cards, one at a time. It is nice seeing Yue again. I like how Sakura consults with him. There’s something about that moment that makes Sakura come off a bit more mature. Syaoran is a worrywart. I’m not sure why he seems to express great concern when he sees Sakura and Tomoyo go off together. Is it jealousy? Is it just some other form of worry. I guess we’ll have to wait and see. While we are on the subject of Syaoran, I notice that his teddy bear comes into focus when Sakura starts dreaming. Maybe Syaoran is the figure in Sakura’s dreams. I hope not, but then I hope that it isn’t Eriol either. Still, whomever this person is in Sakura’s dream, they provided Sakura with a new key. I’m guessing this will be a new staff. I’m also guessing we’ll get some new incantation. That is, unless this new key produced the giant snake creature outside. It is hard to say for sure. Finally, Naoko and Yamazuki finally have a speaking role in this chapter. It appears the two of them will used for comic relief to toy with the naive Syaoran. In the end, Cardcaptor Sakura Clear Card Arc 02 is a fun manga chapter that continues to set the plot table. With a new anime project on the way I wonder if it’s going to be continuous with first anime series. To be honest where the anime left off it’s pretty easy to lead the events into the Clear Card arc since the only thing the anime didn’t show was Sakura and Li in a new school semester. It’s far easier to do it with this series than like the discrepancies between the Tsubasa TV and OAVs which contradicted many events between the two. I like, so far, how this series feels like a return to classic CLAMP and I hope they continue this route and avoid trying to link this to the hot mess that is the Tsubasa/xxxHolic-verse given all the overly complicated plotlines and then completely rebooting everything. I agree with you 100% here. That’s one reason I’ve been loathe to read the Tsubasa World Chronicle series.